So I said I was going to wait till the weekend before retrying the ranking dungeon in my previous results POST, but patience is a virtue I may or may not posses. I spent some time theory crafting my run and where was the optimal place to use my actives. I also realized I could utilize dark TPA on every floor except Neptune (8) and Athena (10) as a means to conserve dark orbs. Of course I had to move VERY fast while avoiding heart matches except for the first floor and once between floor 2-6. For the first blind attack, I revealed 2/3 of the board and made a TPA match, then revealed the remaining portion on the next floor. Floor 9 I revealed the entire board so I could see where my 5 combos and 2 rows could be placed. 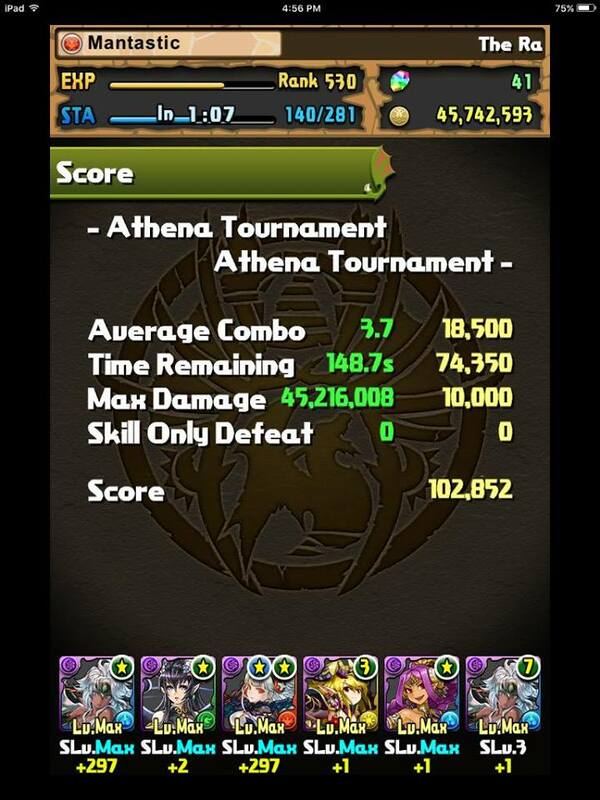 I am quite happy with this result as there are most likely very few non-Shiva Dragon teams in the top 1%. This should safely secure a top 1% placement as the cut off for 1% was ~98.5k (at time of posting) which is over 4,000 points lower than my score. Hopefully this ranking dungeon allows you to hit a new personal best. Usually we see a lot of the same teams in the final result, and I quite sure that your team is unique in this tournament. Seriously, this is about making history. Nice man! Haha, gratz on that!